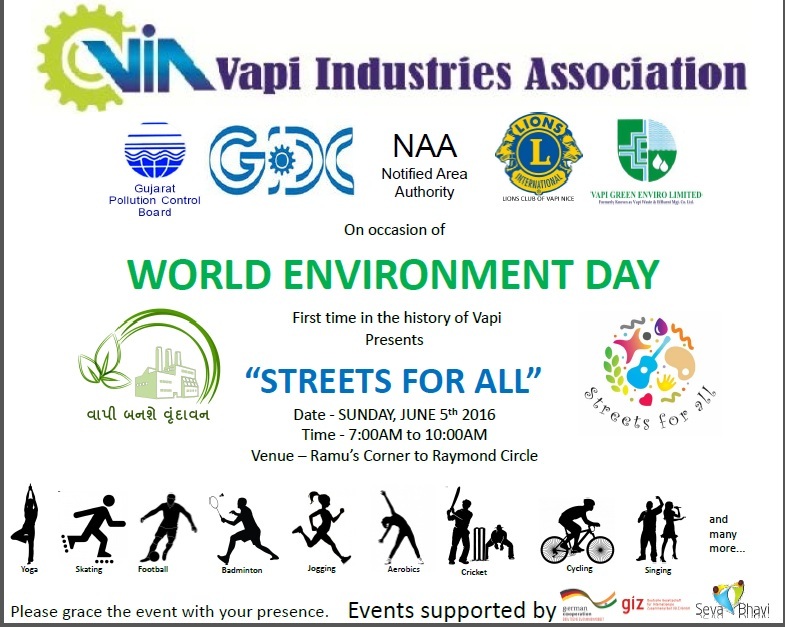 Dear All, It is our pleasure to inform you that we will be celebrating World Environment Day on 05th June 2016, Sunday like every year and Environment Drive for one month beginning this day in association with various stakeholders GPCB, GIDC, NAA, Vapi Green Enviro Ltd. (VGEL) & Lions Club of Vapi Nice and is supported by GIZ, Seva Bhavi and various NGOs of the estate. As a part of this celebration of one month Environment Drive we have organized an event called “STREETS for ALL” inaugurated by Smt. Remya Mohan IAS, Hon’ble Collector & DM Valsad District and Shri Kanubhai Desai, MLA Pardi from 07:00 AM to 10:00AM on 5th June 2016, Sunday at Gunjan Residential Area from Ramu’s Sandwich Corner to Raymond Circle followed by Tree Plantation at various places of Vapi GIDC estate. We welcome you to witness and participate with family and friends for the first time event in Vapi.